Get ready for another DuckTales adventure and help uncle Scrooge in reaching all treasures, both hidden and free to collect. Use your stick and jump with its help, smashing obstacles and enemies around. 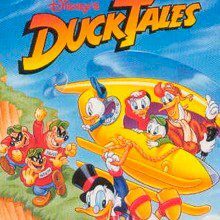 DuckTales always surprise their fans, but when something extraordinary happens, that surprises even the world of ducks! Uncle Scrooge left his tower and went on the exciting adventure. Gather as much treasures as you can, using a stick in your hands. Kill various enemies and open chests with diamonds within.